The bathroom is a sanctuary in your home – a space for you, your privacy, primping and even relaxation. Remodeling this space, be it a master bath, hallway bathroom, or powder room, usually increases your quality of life and also your home’s value. 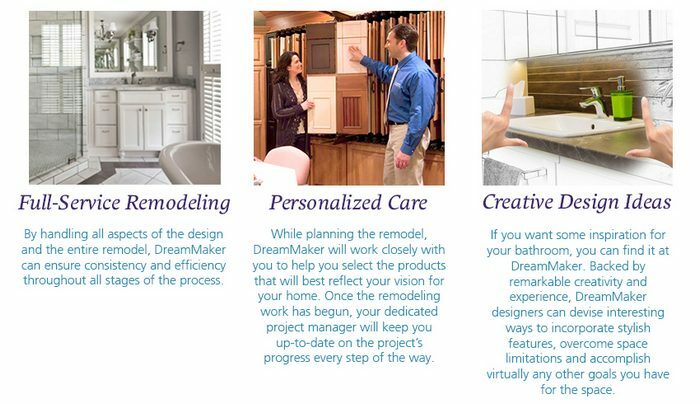 Let our DreamMaker franchises help you plan, design and create the perfect bathroom for your lifestyle that fits within your budget. DreamMaker Bath & Kitchen franchises can provide you with everything you need to turn your bathroom into the spa of your dreams! As you are researching our services, also visit our extensive bathroom portfolio for photos taken from actual DreamMaker projects. Our clients tell us the best place to start in is our design center. For additional ideas, come to our Design Center where one of our designers will walk you through the bathroom showcase and answer any questions you may have. Aging in place? There are several universal design considerations to make for someone with limited mobility including safety bars, walk-in showers, wall-mounted sinks, wider doorways with paddle handles, and open floor space.We are proud to serve homeowners in Ann Arbor, including Dexter, Ypsilanti, Saline, Canton, Brighton, Chelsea and Plymouth. Come visit us in our design center or give us a call today regarding your bathroom remodel.